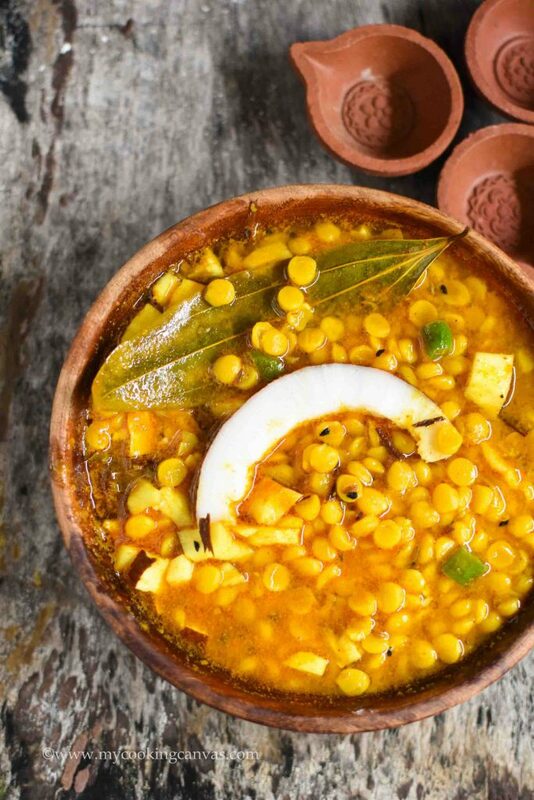 Cholar Dal is an authentic preparation in West-Bengal. A curry which is relished with luchi or kachuri on any celebration day. My granny is a Bengali.The place where I was born has the impact of Bengali culture to the most. Whether it’s food or festival. And my Mom excels in both cuisines, sometimes she creates fusion too. Since childhood I love festivals, it brings Joy of traditional festive dishes.Cholar Dal has everything to bring back those Memories. Cholar Dal is such a dish that Mom prepares for breakfast along with hot dal-kachori on Diwali Morning.And the smell when she starts that tadka with a dollop of Ghee strike your Hunger-Pangs unexpectedly. You will end up eating 6 kachoris instead of 4. This dish goes well with Kanika too.. While many people add panch-phoran in tadka ,I like to add only cumin and kalonji to it.So again It’s your personal choice. Though there will be a difference in taste. Again you can add garlic paste to it if you have no such food restriction on festival. Don’t ask me, I don’t follow any rules when it comes to food. I eat what I feel and love to ..That’s my way of Living beyond all restrictions! Today is Dhanteras.A day which is considered as auspicious to purchase gold or silver.It marks the beginning of Deepavali or Diwali.On this day the Goddess of Wealth, Lakshmi is worshipped to provide prosperity and wellbeing.In the evening, diyas of clay filled with oil are lit at the entrance door of the house to welcome Goddess Lakshmi. I will prepare Moong Halwa in the evening.A festive-comfort food which gonna suits the evening rain.In most part of the country, People are still enjoying Monsoon. Almost every evening in Bangalore we are getting a good rain which may bring disappointment to those people who crazily burst crackers on Diwali.But I hate crackers. Cholar Dal is an authentic preparation in West-Bengal. A curry which is relished with luchi or kachuri on any celebration. Soak chana dal in 3 cup water for 3 hours .Drain the water,add turmeric powder and salt. Boil them till they are done or pressure cook them in 2 cup water up to 2-3 whistles. In a pan heat oil. Add bay leaf, cumin seed and onion seed.fry for 30seconds. Add cardamom, crushed cinnamon and chopped green chilis. Add ginger and garlic paste and fry for a minute.you can skip garlic here if you don't like. Add chopped coconut, red chili powder and fry for 30 seconds.Add sugar and mix.Add the cooked dal with water and let cook for 4 to 5 minute. serve hot with luchi or poori.you can enjoy this dish with roti or paratha also.